One of the great features included in Linux by default is the IPtables software firewall which does a good job of protecting the PC from unwanted intrusions whilst on-line. Sadly, its' command-lines are complex and even experienced Linux users can struggle to configure it. So I looked around for a friendly graphical interface as a front-end to configure the built-in IPtables/IPchains utilities for me. 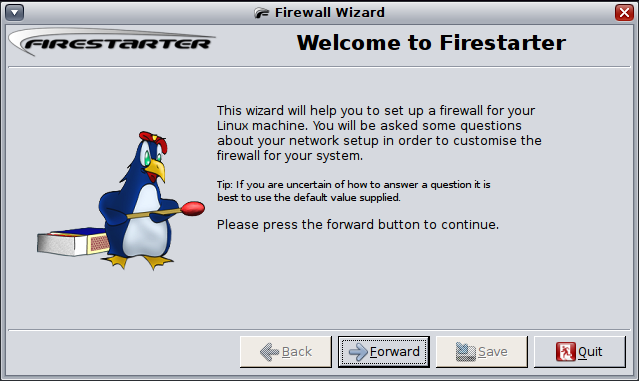 There are good ones around - FireHOL, Firestarter, Firewall Builder, KMyFirewall, Guarddog, Shorewall - and much debate as to which is best, but I chose Firestarter. Please remember throughout this, Firestarter is the configuration tool, NOT the firewall itself. It is only as good as the information you feed it. Firestarter is contained in most repositories so you can install through Synaptic Package Manager, or if you really must, by running: sudo apt-get install firestarter in a terminal. Running System > Administration > Firestarterfor the first time launches the Set-up Wizard. Before you say 'wizards are for wimps, Linux doesn't need them,' this one is good. Although I still can't tell if the Firestarter mascot is some kind of mutant-penguin or a chicken. As Firestarter is a system administration tool, it will ask for the root password on launch. First it will detect your network devices; you select one for firewall configuration from a drop down menu. 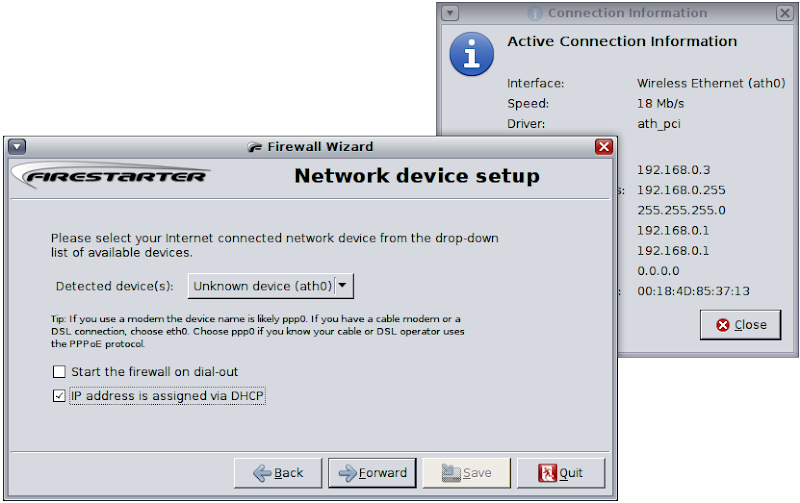 Modem users get the option to enable the firewall on dial-out. The Wizard will also want to know if you are using static or dynamic IP addresses (how your PC identifies itself to your network and the internet). If you connect to the internet through a router, it's most likely assigning your PC's network address dynamically through DCHP, unless you or your Linux buddy explicitly set up static addresses. If you leave all that to your service provider, they will be assigning DCHP addresses for you. The firewall needs to know this in order to set some base rules for internet traffic - otherwise you'll be blocked from everything! Usefully, right-clicking the Network Manager icon in the desktop panel gives you a Connection Information pane identifying your active network device and current IP addresses, but not the address mode for static or DCHP – you need to open Network Manager itself to find this (System > Administration > Network). 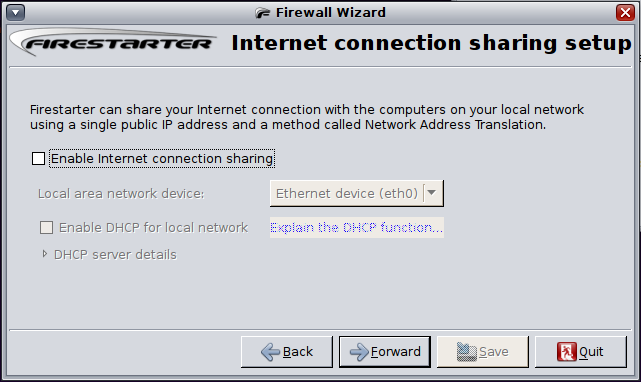 Next, the Firestarter wizard asks if you want to set-up Internet Connection Sharing. If the PC you're configuring is the firewall for your entire network and your other computers connect to the Internet through this one, then you want to enable this and select the network hub or switch that device that connects them. All this kit is 'behind' the firewall and is different from the router or modem used to connect to the Internet which will be 'in front' of the firewall. The final step is to check the “start firewall now” box and click on Save. Once you've completed the Wizard, Firestarter will launch into the main application window, which consists of three tabs: Status, Events, and Policy. 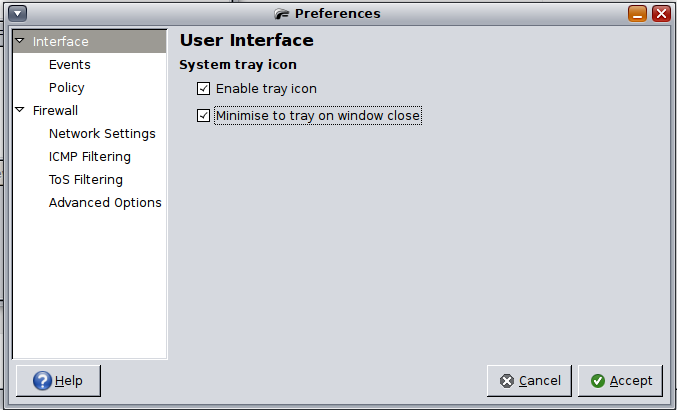 The user interface has a toolbar of big shiny buttons for common tasks and a full menubar for all the operations. It's very easy. Really. It is. Active: firewall is running and applying rules to all connections. Stopped: firewall is turned off, so all connections are allowed through. Locked: firewall will disallow all connections in and out. Useful in the event of a security breach should you need to lock the firewall and disable the network entirely. Changing state is a simple one-click operation if you use the toggle buttons on the toolbar to Start/Stop and Lock/Unlock. Events The Events tab will list blocked events. Don't be alarmed at everything listed here; generally only the entries in red represent a threat as far as the firewall can tell. These are the connection attempts that are targeted at ports used by important system services. You may decide, with your superior Mark-I human brain to allow a blocked connection as safe; select the blocked connection, right-click and select Allow from the pull down menu. Unsolicited inbound connections from the Internet to the firewall or client hosts are always blocked. The firewall host is freely allowed to establish new outbound connections. All client machines are allowed to establish new outbound connections to the Internet, but not to the firewall host. Inbound traffic from the Internet in response to requests from the firewall or clients is allowed through the firewall. The good (or bad) news is you can amend policies to be as simple or as complex as you want. You can also set the firewall to be permissive or restrictive (more on that later). If you want to create new policy rules, make sure which policy (inbound or outbound) you want in the Editing selection drop-down. 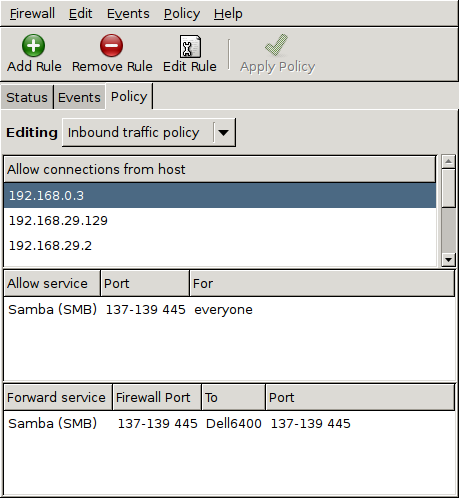 The Policy tab is split; the upper pane is for Hosts and the lower pane is for Services and/or Ports. To make a new policy, right-click in the appropriate pane, then click the Add Rule button on the toolbar . 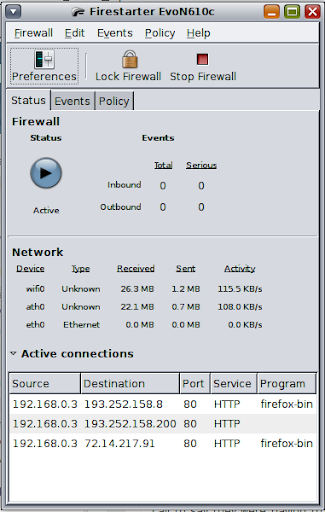 For example, to enable your LAN, add the network IP addresses, something like 192.168.1.1/24. It's entirely up to you what rules you want to enact, but best enable them one at a time so you can test things individually. To edit an existing policy select the appropriate policy in the window, right click and select "Remove Rule" to delete the rule and "Edit rule" to modify the rule. The Edit Rule dialog box enables you to define IP addresses, domain names or network names – your choice – then pokes this information into the IPTables config files in the background when you confirm it by clicking the '+ Add' button. Permissive: permit all traffic except whatever you define as black-listed in your user rules. This is the default, open-access setting. Restrictive: block all traffic except whatever you define as white-listed in your user rules. This is the high-security setting for the extremely worried system administrator. Or possibly parents. 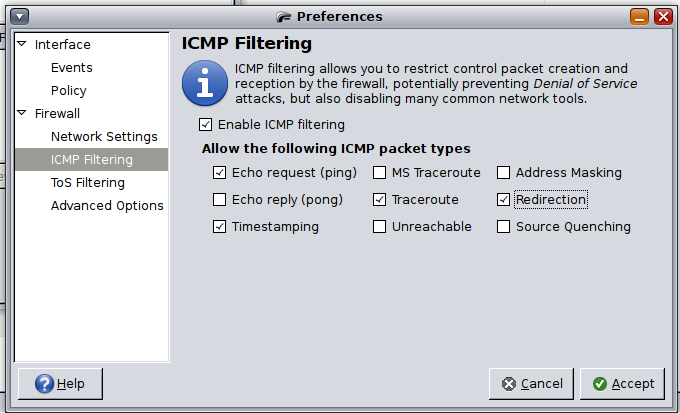 ICMP stands for Internet Control Message Protocol - we knew that, right? When you set-up your network, you probably ran some tests by 'pinging' message packets to other machines on the network or on the internet to make sure you have a connection. Just like sonar in submarines. Outsiders may also be able to 'ping' your network address and confirm it is a live target. Firestarter allows you to set filters to block Echo Request (pings outbound) and Echo Reply (response to pings inbound). Disabling replies will stop your machine from responding to incoming requests, this silence effectively saying “nobody home” at your network address. I always leave open the ability to ping an outside machine as its the most basic networking test I know. Other options such as Traceroute are low risk and can be useful, so I leave them enabled. 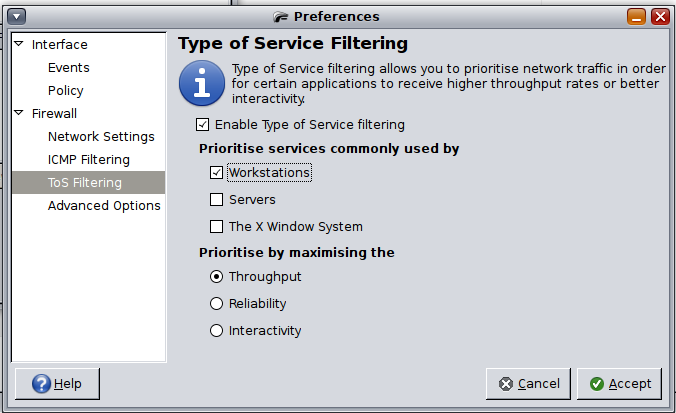 ToS Filtering: Type of Service filtering will allow you to set which types of applications receive priority in network traffic. For example, if your computer acts as both workstation and server, you might want to set workstation processes as a priority over server processes such as HTTP from other users or applications on your network; Firestarter allows you to prioritize connections, as well; using the "throughput" option allows the most traffic through the firewall, while "reliability" reduces the transfer rate in favor of a more dependable connection. The Firestarter manual lives at Community Ubuntu Documentation, https://help.ubuntu.com/community/Firestarter.